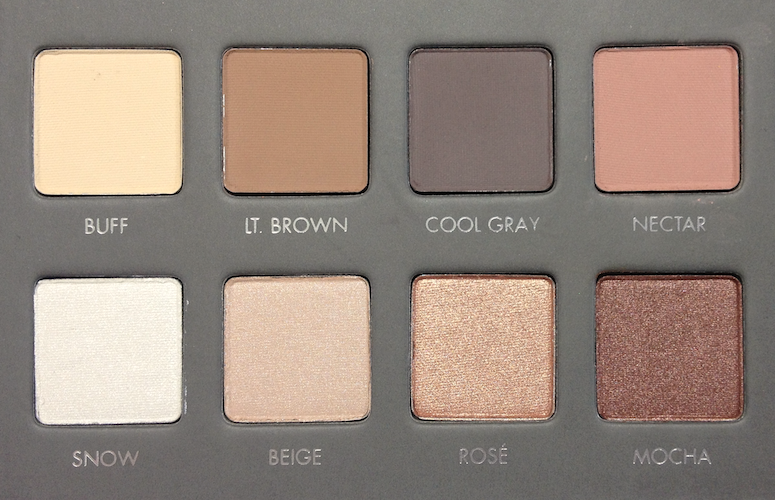 The first Lorac Pro Palette was a bit of a slow burn for me. Looking back at my review, it seems a little lukewarm compared to how I feel about it now. It easily makes it on my top 10 lists, especially in the categories of 1) travel-friendly, 2) versatile, 3) practical, 4) pigmented. 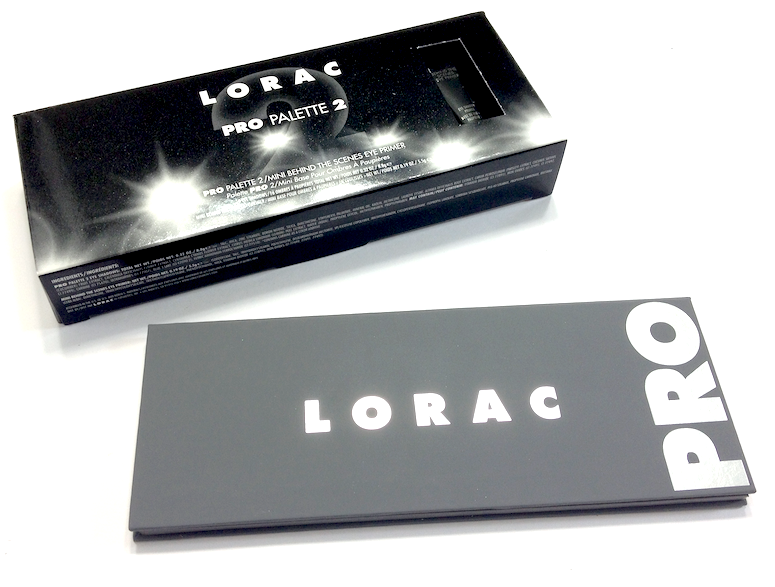 With those expectations in mind, I hoped that the Lorac Pro 2 would prove a worthy follow-up. And it does. 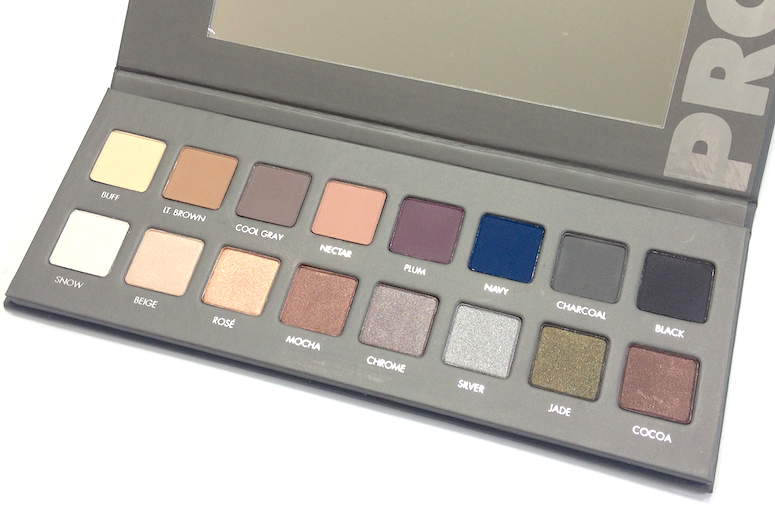 In terms of pigmentation, the Pro 2 stacks up with the best of the Lorac palettes. Both the shimmers and the mattes have fantastic payoff, with the shimmers in particular having the sort of densely buttery and soft texture where you barely need to tap a brush into them to get more than enough product. The mattes are silky, smooth and soft - I was particularly wowed by Navy, which is an incredibly difficult colour to get even just half-right (Nars Outremer, anyone?). Like the first Pro, I do find that the softness can pose a challenge. Where the shimmers have a nicely dense texture that makes their ease of blending an asset, the matte shades have a thinner consistency. 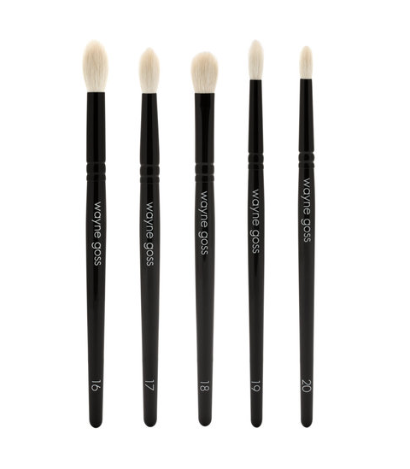 Combined with their strong immediate pigmentation, that ease in sheering out can make some of them them appear patchy or "dirty" upon blending. I noticed that occurring when I loaded up my brush, blobbed the product on and then attempted to buff it out - it really didn't work, whereas the shimmers had no issue with this "technique". For the darker matte shades especially, the controlled-dab-blend-repeat process was best, and really took advantage of their inherent qualities. As much as I like this palette, I would hesitate to recommend it to eye makeup beginners, or even more practiced makeup lovers who just happen to prefer going in with a stronger hand. I think the latter will like the pigmentation, but won't love the change in application method needed to make the most of the palette. This is the lighter, more everyday/neutral side. Buff: Has the thinnest, most flyaway texture. It's a too powdery to build up very well without looking chalky, so for me it works best as a base for the darker colours to helps blend them out, or as a matte browbone highlighter. Light Brown: Very smooth, almost creamy texture, with fantastic pigmentation, not prone to sheering out. This is the perfect all-around shade. Cool Gray: Similar texture to Light Brown, this is an excellent crease or outer corner colour. The name is weird, because I would consider this a warm gray, as it almost seems to have a brown undertone. Nectar: Also similar to the two previous shades, this beige-toned peach is perfect for all over the lid or as a transition shade, depending on your skin tone. Snow: A frosty white, with fantastic payoff. Definitely a colour to use sparingly, thought it can blend out. Beige: A beautiful champagne shimmer, with a creamy, soft, dense texture and lovely payoff. Great highlighter. Rosé: A metallic rose gold, with that same superlative texture. This barely needs to be dabbed for excellent payoff. Mocha: Incredibly beautiful pale brown metallic shade, with a mauve undertone. Same texture as Rosé, and pairs perfectly with it. And the darker, more jewel-toned side. Plum: Smooth, silky, every so slightly drier texture. Intense payoff, with some fall-out and that sheering out upon blending. 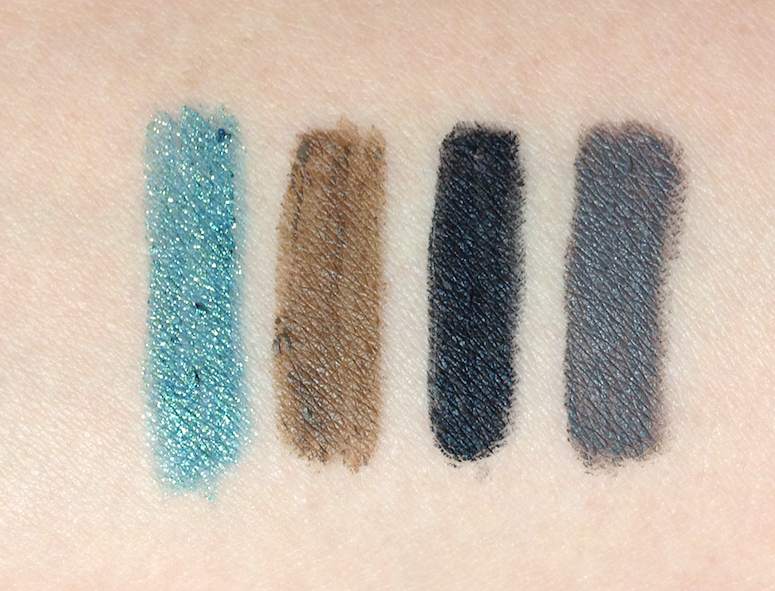 Navy: Has the driest consistency out of these four mattes, but that doesn't affect the crazy rich pigmentation. I mean, LOOK AT THAT. It's also quite prone to fall-out and that dirty, overly sheered look, so definitely one to apply carefully. Charcoal: Similar texture and payoff to Plum. Black: Similar to Plum and Charcoal. It's a soft black, so while the payoff is lovely, it doesn't look too intense. Chrome: Insanely gorgeous taupe with gray and plum undertones. This is an almost metallic shimmer, with a fantastic creamy dense texture. Silver: A straight on metallic silver, slightly sheerer than the other shimmers here, but still a lovely smooth texture. Cocoa: Same texture as Jade, with golden micro glitter in a dark brown shimmer, which also has a faint burgundy undertone. This is a super quick but fairly dramatic eye using this palette. With a fluffy brush I worked Light Brown through my crease as a transition shade, then Chrome on the lid and up to my crease. I then used a pencil brush to lay down Navy in the outer third of my lid and through the outer crease, and blended out the edges with a smaller crease brush. (That controlled dabbing/blending technique I mentioned above. )I also applied and blended Navy similarly on the outer two-thirds of my lower eyelid. 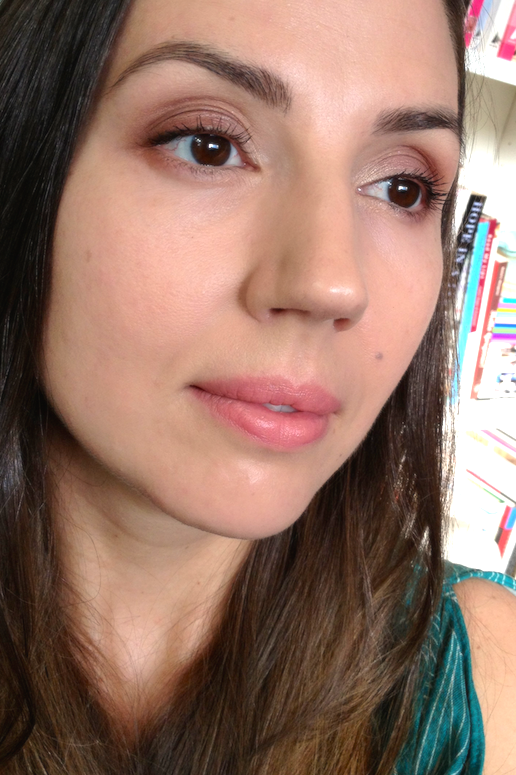 I used Plum to blend Navy into Light Brown just above the crease, and a tiny bit at the bottom edge of my lower lid. A bit of Silver in the inner corner and a quick brush of Buff over the brow bone finished the eyeshadow portion of the look. And Instagram filtered versions, because they're just neat. Availability: This is the sucky part - Lorac is not distributed in Canada, at least not in any accessible retail locations. Naimie's and Nordstrom do both carry the brand and will ship to Canada, though that can be close to 20$. However, Nordstrom has told me that when their stores open in Canada (first one in a few weeks) they will offer free shipping for orders placed with their Canadian stores! I think the first location will be in Chinook, so I would recommend giving them a call once they open and checking if they stock Lorac. :) Price is 42$ USD, not sure what the Canadian price would be. Tarte palettes can be a little hit-or-miss for me. Most recently I ordered and returned the Golden Days and Sultry Nights one (which is currently in the sale section at Sephora), but loved my Aqualillies palette, so when the Rainforest After Dark Colored Clay Eye and Cheek Palette popped up a few weeks ago, I nabbed it right quick. I must admit that the packaging looked swankier on the website. I tried to photograph it without making it look too gaudy, but in this case there was no getting around it. Purple and gold don't exactly convey restrained chic, and the faux-wood plastic casing bears a striking resemblance to the pre-reno paneling in my childhood home. Ah well. I can deal. Especially since the inside is awesome. For 46$ CAD, this contains a full sized limited-edition blush, decent sized bronzer and highlighter (though if you're a Tarte fan, you no doubt have a dozen versions of the Park Avenue Princess bronzer), and six eyeshadows in a variety of textures. 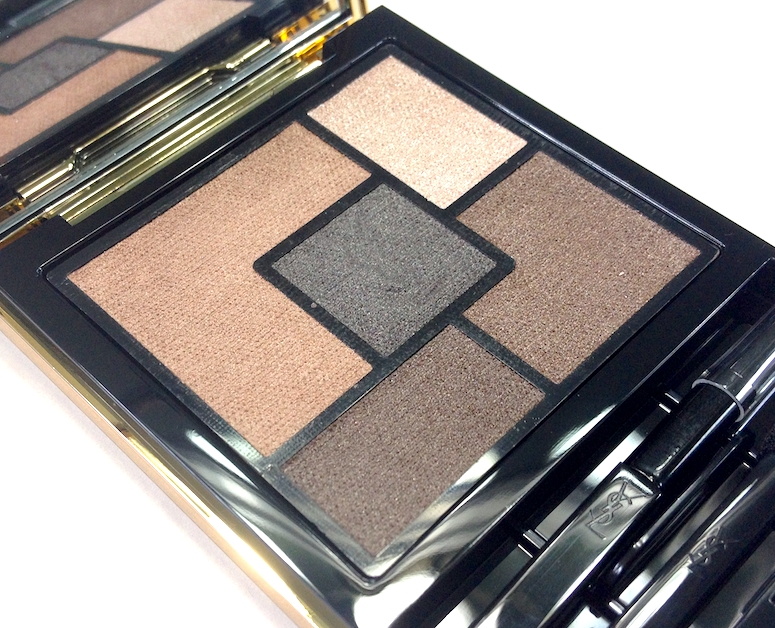 Value-wise, this is an excellent palette. 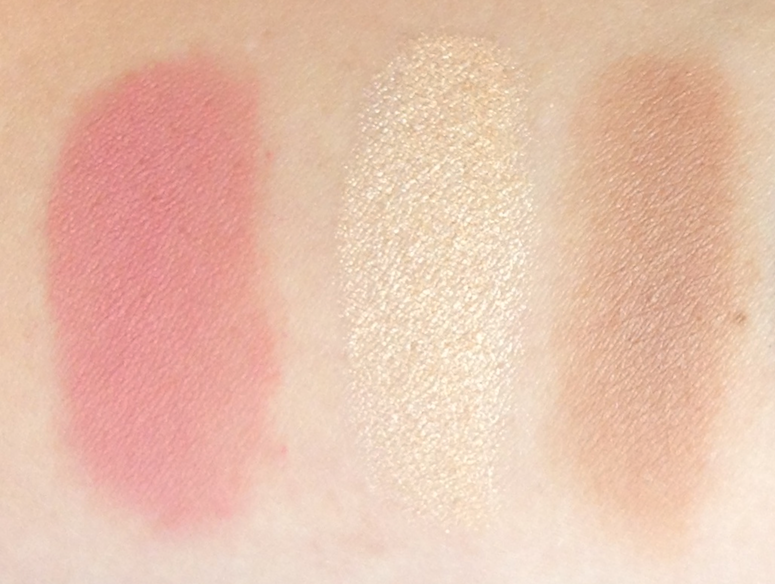 The blush, in the shade Unleashed, is soft, warm-leaning rose with a beige undertone. The texture is perhaps a touch softer than the other Amazonian Clay blushes in my collection, but doesn't deviate in terms of how smoothly it applies or how well it wears. It looks very, very natural with my light skin tone, and I think it would work well for fair to medium skin as a natural flush shade. 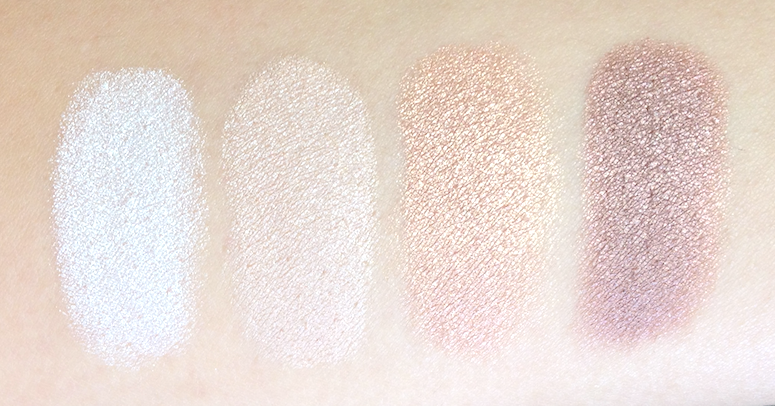 The highlighter, in the shade Champagne, is buttery-soft and dense, with great pigmentation that sheers out easily. It's a little too warm for my skin to use as a face highlighter, but it's perfect for the inner corner of the eye. The previously mentioned Park Avenue Princess bronzer has a firmer, silkier, slightly drier texture that has sheerer pigmentation. It applies smoothly and lightly, and the pale tan shade is ideal if you prefer subtle bronzing/contouring, or if you have fairer skin. It's almost completely matte with the very slightest sheen that keeps it from looking too flat. I also like it as a transition shade on the eyelid. 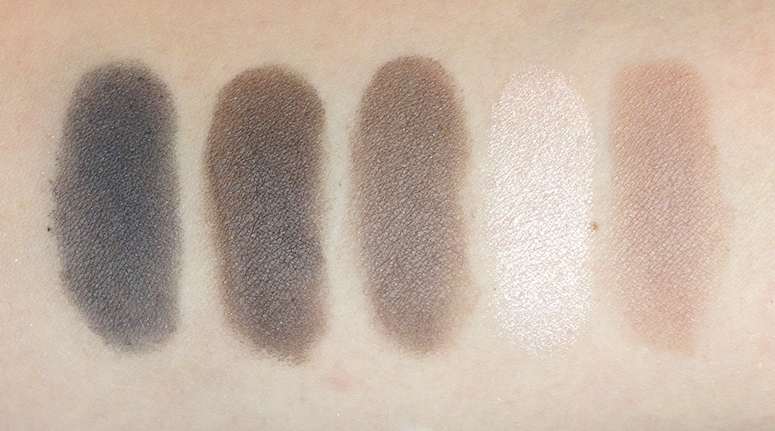 The eyeshadows vary quite a bit in terms of texture and finish. Don't Turn a-Brown - a dark, cool ebony brown with a firm, slightly dry texture and a matte finish. This doesn't swatch all that well, and looks like it might go on patchy, but it actually blends very nicely, and can be packed on for intensity. It also makes a great liner. Tan-gled Up In You - a cool tan, this has a softer, smoother texture than the dark brown, and applies with terrific pigmentation. 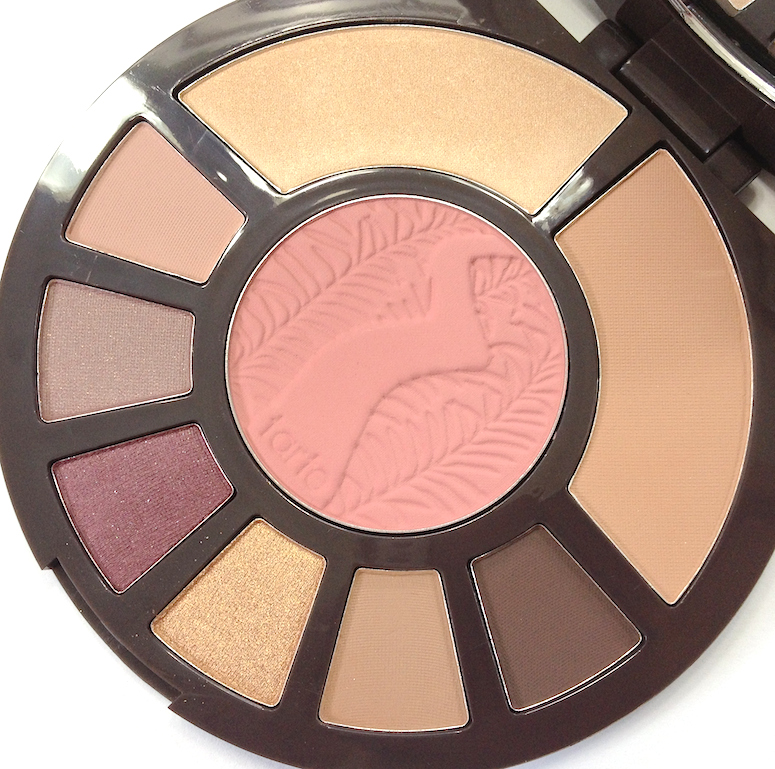 It's a great lid or crease colour, depending on your colouring. Up To No Gold - a metallic gold, with a creamy, dense texture and intense pigmentation. Packed on, it is very vivid, but I do find it can crumble a bit when used with a fluffier brush (though you can get a sparkly wash). Best applied with a firm paddle brush. Plum Away With Me - a rich plum satin with micro shimmer/glitter, a soft, but not overly creamy texture. Although it swatches opaquely, and does apply like so with a firm brush and a good primer, it also tends to get a little powdery and blend out easily. I find that it loses some of that plum tone and goes murky the more it's blended. The shimmer also is more subtle once applied. Make a Mauve - a mauve-toned taupe, with the same texture and finish as Plum Away With Me, though it looks more satin-y on the lid. Same tendency to go a little powdery and blend out, though also the same great payoff when patted on with a dense brush over a primer. 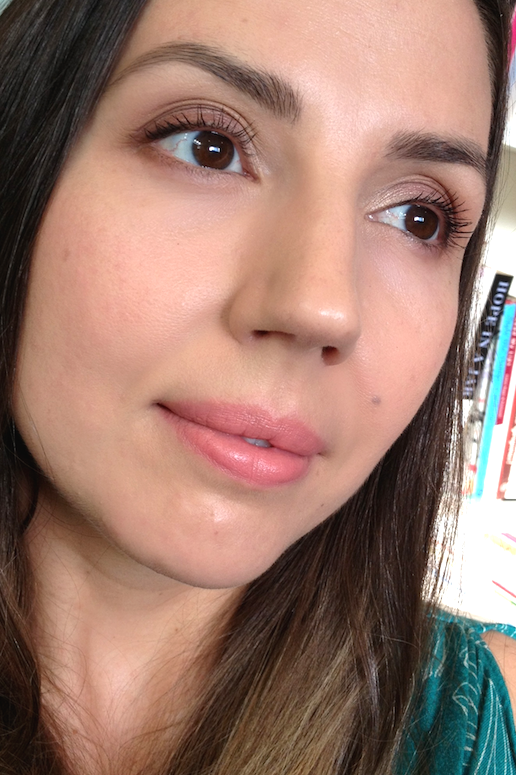 Bare to Explore - pale pink-beige matte, with a smooth, silky texture. 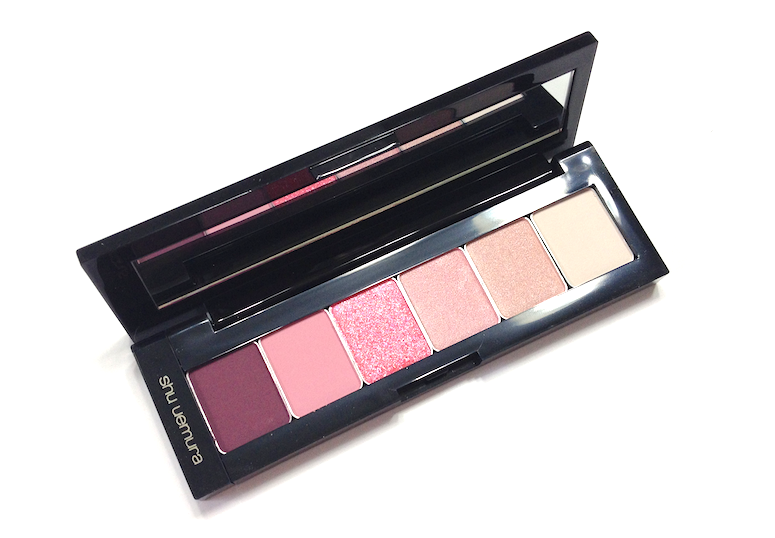 It has good pigmentation, but also blends out really easily. 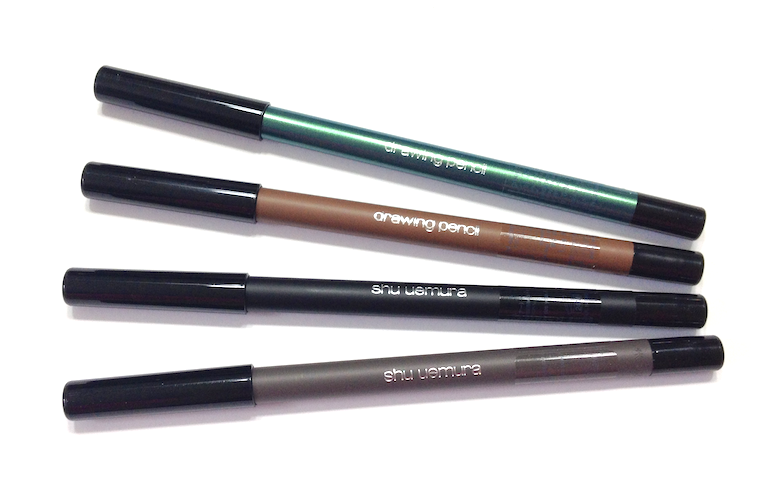 It can be used as a base lid colour, or as a subtle brow bone colour (not highlight). It can also blend out a crease colour very well. I think what I like best about this palette is how well all the shades work together, and how convenient it is. I can see myself tucking this away in a travel bag, and being able to work a variety of looks with it, though still in a neutral category. I appreciate that both the highlighter and the bronzer can be used on the face and the eyes as well. 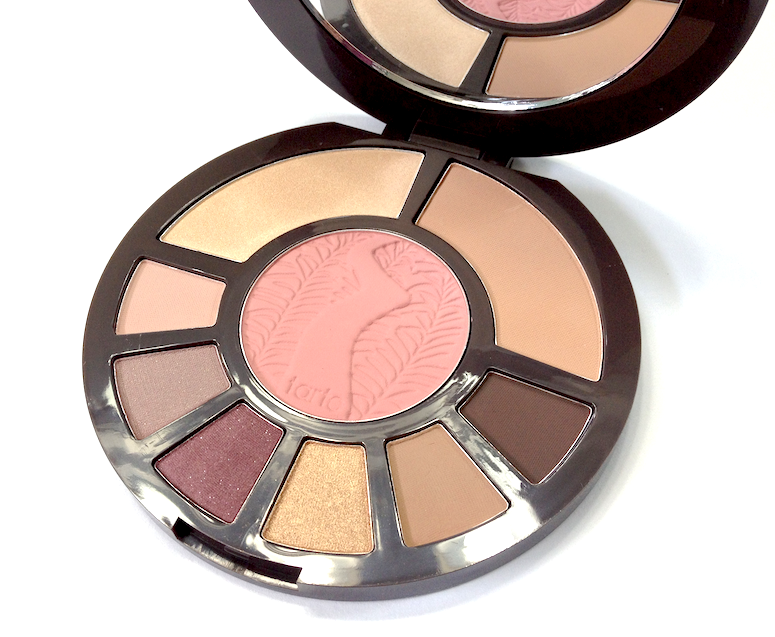 I think as long as you're ok being a little careful with the plum and mauve shades, especially in blending, then this is an excellent palette, especially for work or travel. Here is a soft, work-appropriate look, using Make a Mauve as the lid shade and under the lower lash line, Plum Away blended in the outer corner (see how it reads less plum? ), Tan-gled in the crease, Champagne in the inner corner, and Don't Turn A-Brown as liner in the top lash line. 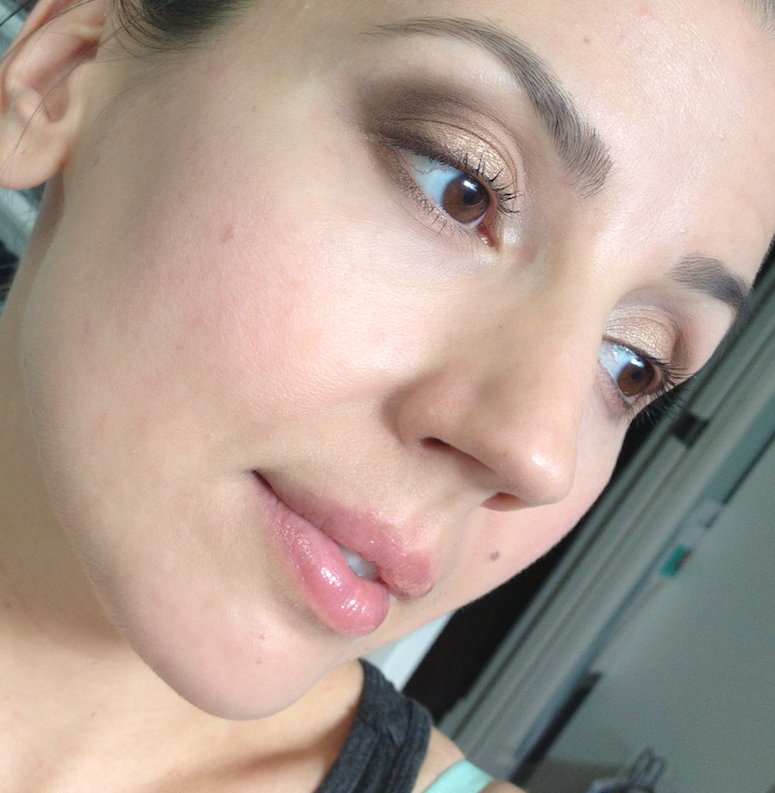 I brushed Bare to Explore just above the crease to blend it out. I also used Unleashed very lightly as my blush. 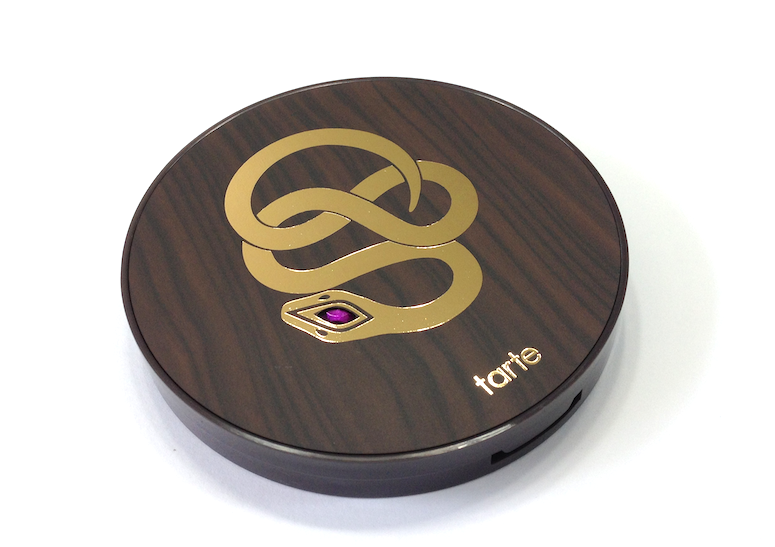 Are you guys fans of the Tarte palettes? I find myself liking their smaller palettes more than those big blockbuster sets these days. 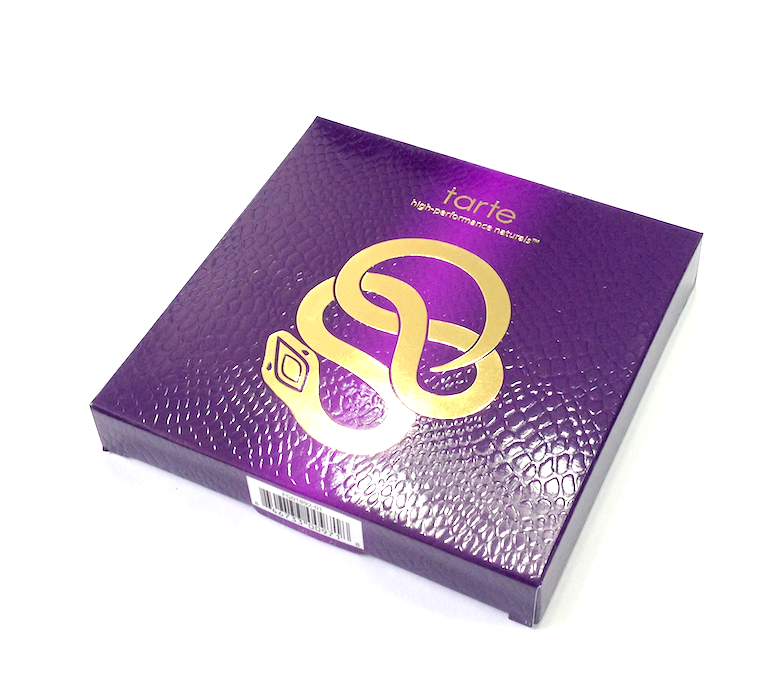 Availability: At Sephora stores and www.sephora.com, as well as www.tartecosmetics.com (which does ship to Canada now). Price is 46$ CAD and 38$ USD. 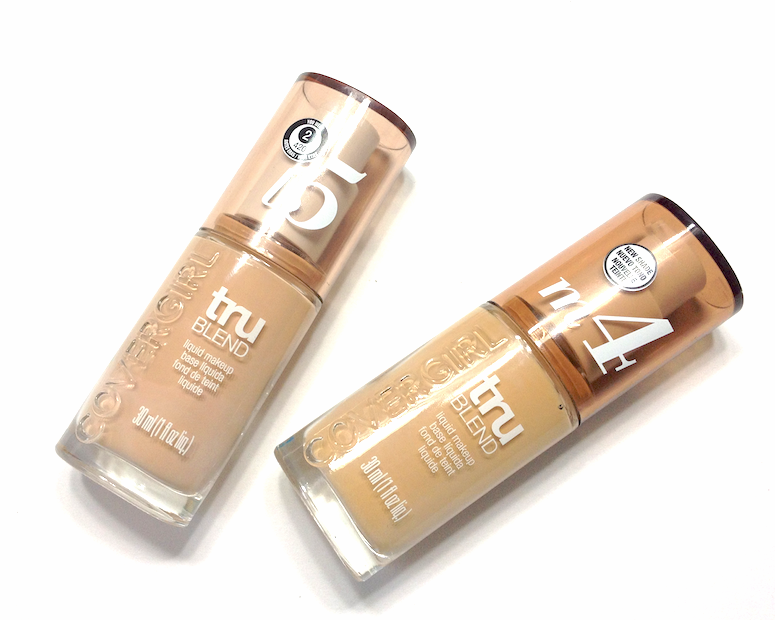 Cover Girl reformulated their truBLEND foundations a few months ago, making the formula lighter and thinner while improving the shade-matching potential. I never tried the original version, so I can't compare them directly. I was sent these two shades to try out, so the colour match is not exact, unfortunately, but it gives you an idea of the range. They are split into three groups (light, medium, deep), with a variety of undertones in each. I think Cover Girl has improved a lot in terms of their foundation colours - I remember a Clean foundation I had as a teenager that was, quite literally, pink. I looked like I had dipped my face in calamine lotion. 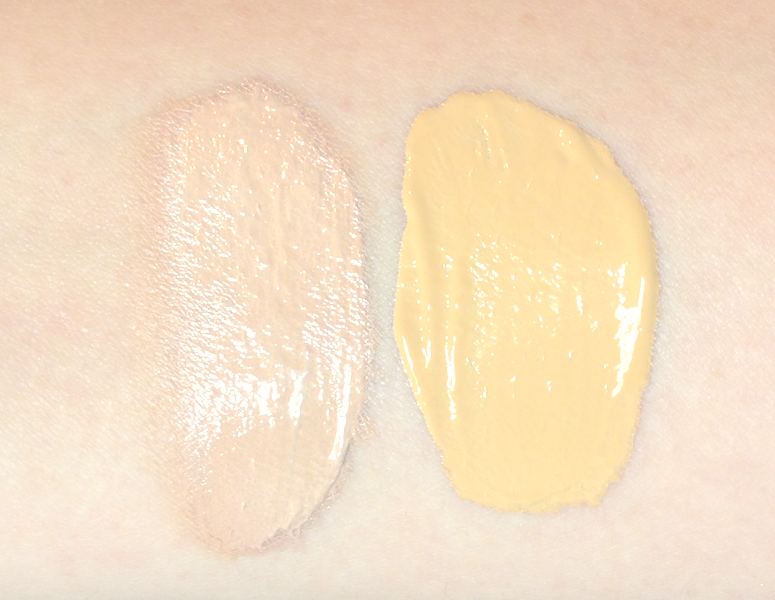 Thankfully the formula here is forgiving as well, despite the good coverage, so while the l5 Creamy Natural is a little too dark and cool for my skin, I can get away with it, as long as I blend well around the ears, or else it leaves a noticeable line. If you have truly neutral or olive-toned skin, this foundation might require some shade-mixing, so while it is inexpensive, you'll likely need to experiment with a few bottles to get an exact match. Also a bit strange, the liquid pumps out with a strange streaking of white pigment, but it disappears as soon as I blend it in. It doesn't seem to alter the application in any way. In terms of coverage, this is a solid medium. In the picture below I applied it relatively sheerly with a moistened buffing brush, and I still got decent coverage out of it. Despite that, it still looked very skin-like to my eye, with a lot of natural glow (which if you have oilier skin, will probably translate to too much shine). While it smoothed over dry patches nicely, I found it slightly emphasized the texture around the lower part of my cheeks, where I tend to have any residual acne scarring and dilated pores. Again, probably better for drier skin. Lasting power was really good - it didn't go cake-y or fade over the course of 8 hours, though the glow definitely turned to shine on my t-zone, and I had to use blotting papers twice for that. Despite the shine, I didn't actually get any separation or fading there either. I definitely prefer the Ready, Set, Gorgeous foundation for my particular skin needs (video review here), but I think this is a good reformulation, and a solid drugstore option if you're looking for a glowy, natural finish foundation for normal-to-dry skin, that still provides good coverage. Availability: All drugstores that carry Cover Girl products, as well as Wal-Mart and Target. Prices vary between 10$ CAD and 14$CAD, and the least expensive I found was at Wal-Mart. In case you've missed the social media blitz, Makeup Revolution is a relatively new drugstore brand out of the UK, setting up shop in Superdrug locations (and online) this past March, and combining very attractive pricing with an on-trend and rapidly expanding range. They are very known in the youtube world for making spot-on dupes (colour-wise, anyway) of the three Naked palettes from UD (their versions are named Iconic). I only have Naked 3, so I wouldn't be able to compare them for you either way, but I did receive two of the other palettes in their Redemption 12 Shade Palettes range: the Essential Mattes and Essential Shimmers. I was also sent two of their Baked Blushers to try out. In terms of packaging, it's exactly what I expected for a brand at this price point: simple, inexpensive but sturdy plastic, and unfussy font. The eyeshadows in the palettes are arranged in narrow strips, but not so narrow that you can't fit a crease brush comfortably. 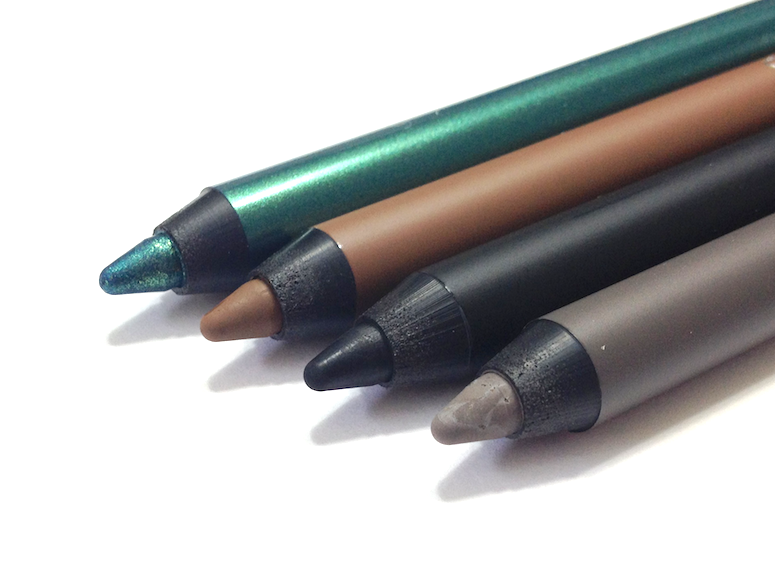 The long sponge tipped applicator is of negligeable value, but the space for it is perfect for stashing an eyeliner or a smaller, good quality eye brush. The variety of shades and non-flimsy packaging makes these nice for travel, but a mirror on the inside would have been a nice feature for that purpose. The blushers also lack a mirror, the clear flip top lid showing off the admittedly gorgeous swirls of colour. 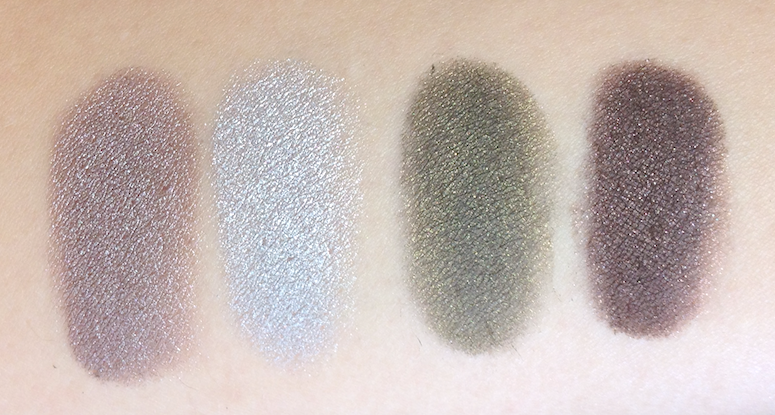 The only ones that gave me significant trouble in terms of going on sheer or patchy were the black in the Mattes palette, and the glittery plum brown in the Shimmers palette (third from the right, felt a little gritty too). 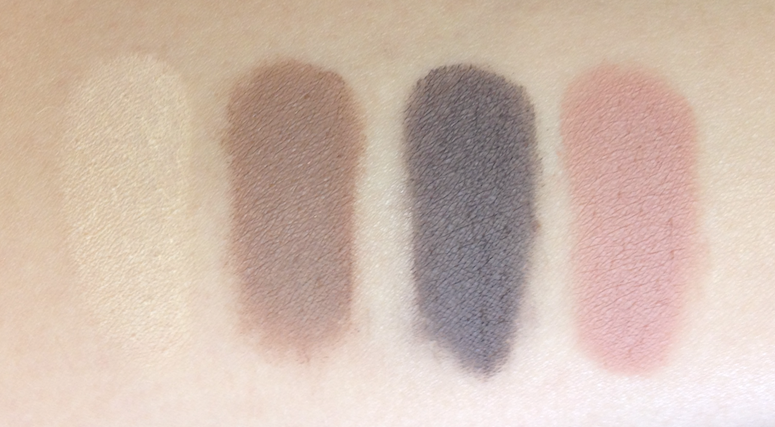 The pale mattes also could have a bit more punch, but for using on the brow bone or as a base, they're fine. 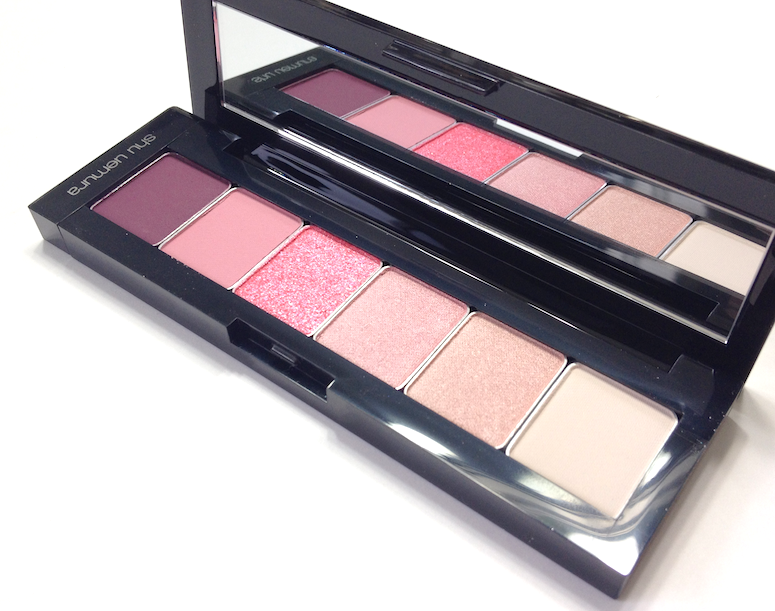 The texture of these is lovely to the touch - the mattes feel smooth and silky, the shimmers quite creamy. Honestly, I wasn't expecting them to feel so nice! That said, the solution is super simple: a tackier base. A paint pot is fine, but I actually got the best results using my regular primer and then applying a thin layer of liquid concealer, and then the eyeshadows over that. The pigmentation showed up true to swatch, there was no fallout or over blending, and the finished look was beautiful, and lasted 8 hours without a problem. 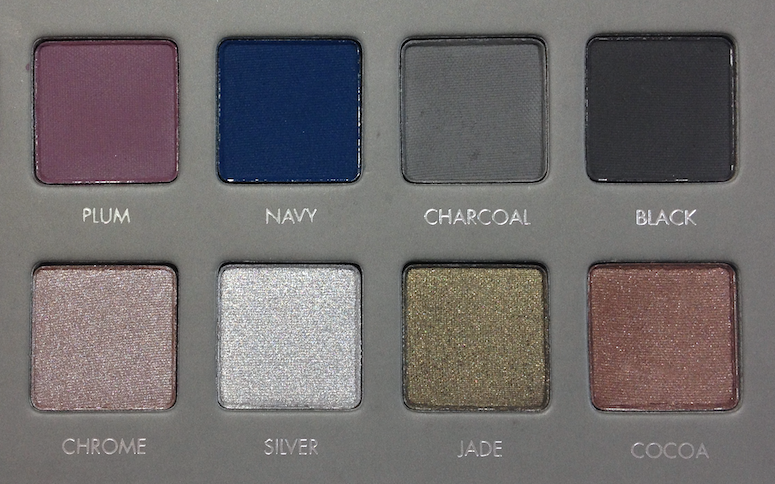 And for palettes that come out to 7.40$ CAD? I really don't mind changing up my usual eye base. 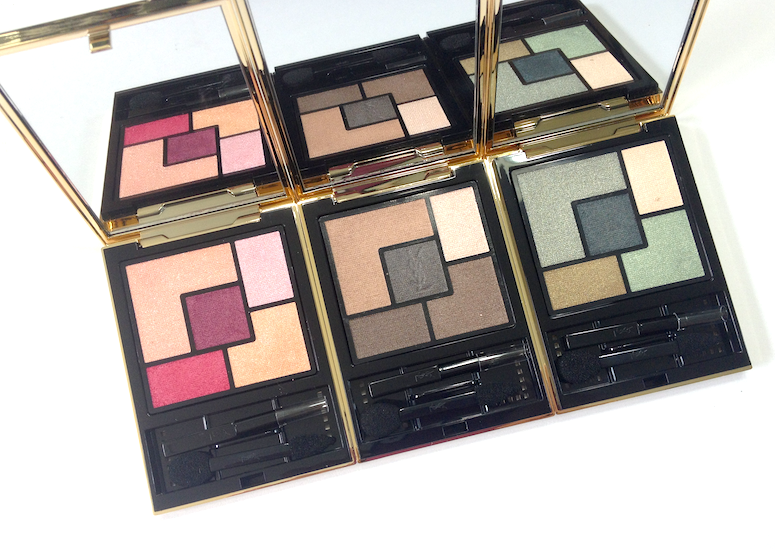 I think in terms of overall quality, they're very comparable to my Sleek palettes, though a different kind of texture altogether. The Baked Blushers aren't quite what I expected either. 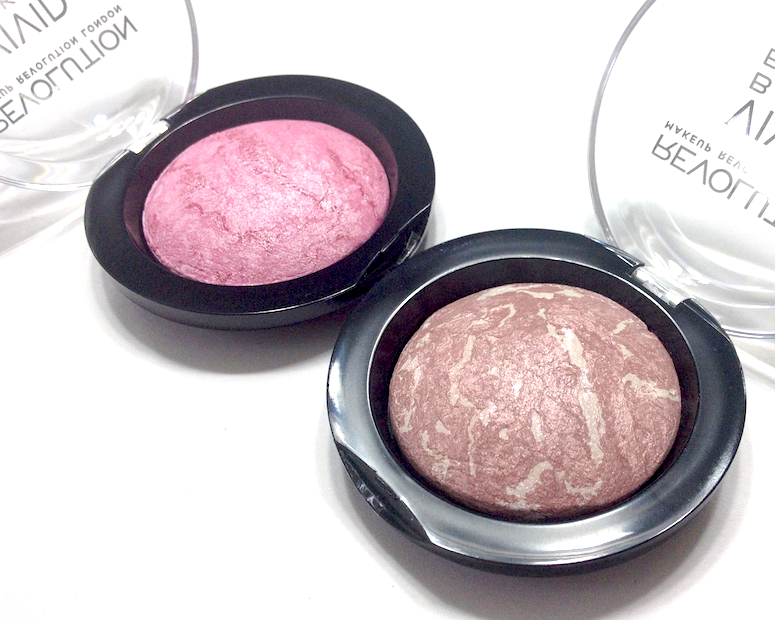 I imagined them to function more like traditional blushes, but they actually go on more sheer and shimmery. 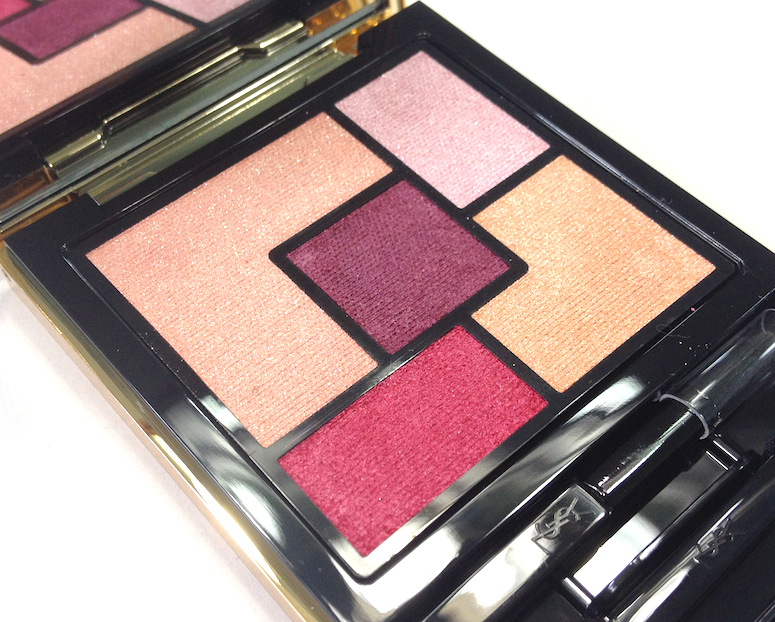 If you are fair, you might be able to get away with wearing them softly as a glowy blush. On my skin tone, I found that getting the colour payoff I wanted translated to a bit more shimmer than I generally wear during the day. Bang Bang You're Dead is a vivid cool medium pink in the pan, and goes on paler. Hard Day is a cool tan with incredible mauve iridescence in the pan, and swatches, strangely, as peach. The texture is on par with most other baked/mineralized products, meaning they have a firm, somewhat dry, smooth feel, and kick up a ton of fine powder. Baked Blusher - Bang Bang You're Dead and Hard Day, heavily swatched and buffed out. 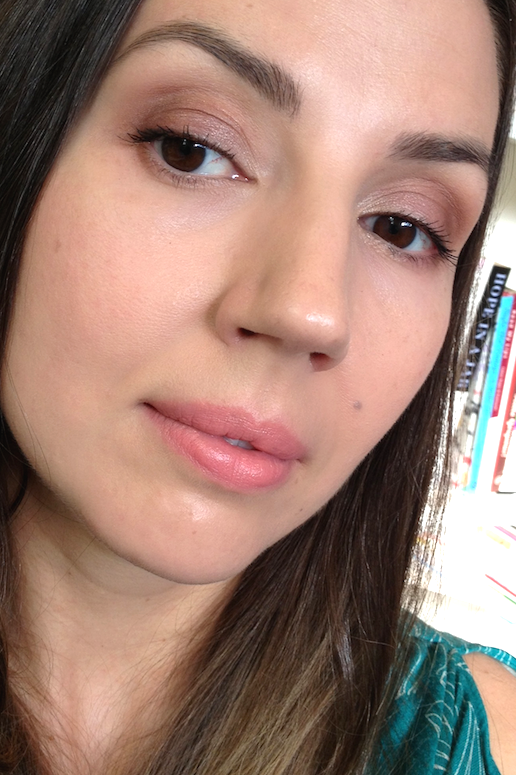 Here is a full(ish) face done with a combination of shades from the Essential Mattes and Shimmers. I used the dirty gold shimmer all over the lid, the pale gold cream shimmer in the inner corner, a combination of the matte beige and light brown shimmer through the crease, and the two darker matte brown shades in the outer corner, layered and buffed out with a fluffy crease brush. I also used a combination of both blushes on my cheeks, with a bit of the MUFE powder foundation overtop to mute the shimmer. If you're not inclined to shop mass retail for your makeup, you probably won't be swayed here. This is a well put together budget brand, with a big catalogue and great performance for the price point, but I don't think it's really comparable to high-end, be it in terms of packaging or feel. 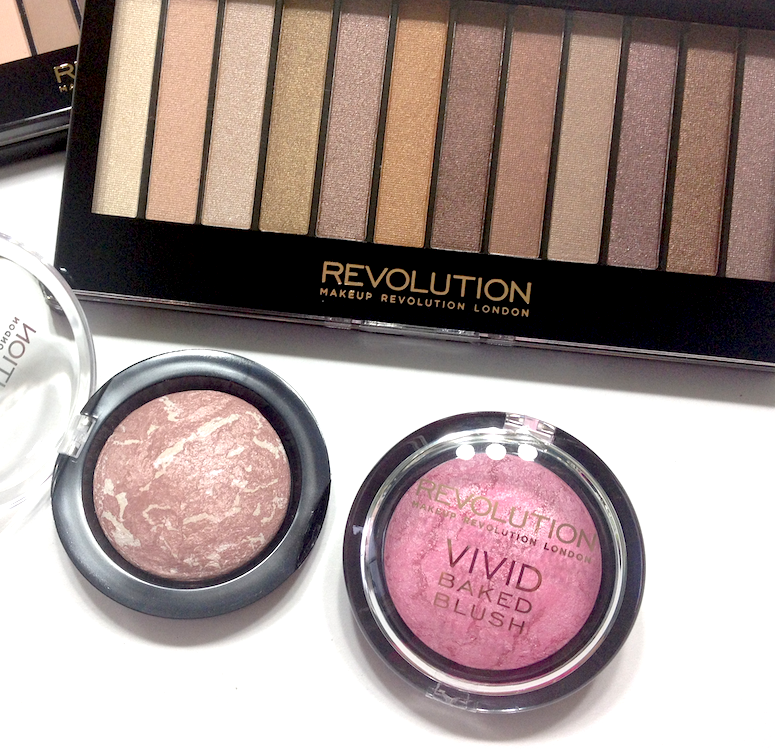 However, if you're concerned about price, or just like/prefer to shop drugstore, then Makeup Revolution is a very solid contender. Availability: At Superdrug in the UK, on http://www.makeuprevolutionstore.com/ otherwise. 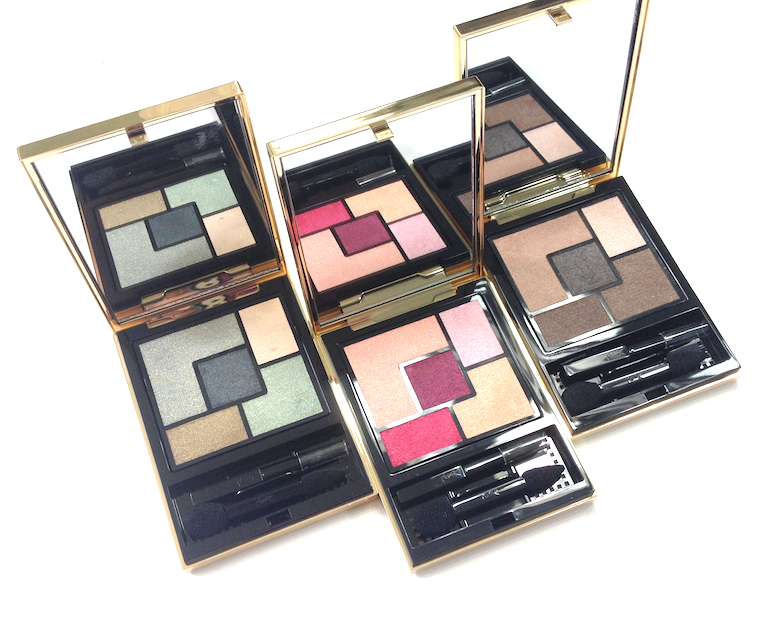 YSL palettes tend to be a dividing line for a lot of makeup junkies. Most of the ones in the past have tended towards the sheerer side of the pigmentation spectrum, which serves those who prefer a diaphanous wash of shimmer, while frustrating those who prefer a punch of pigment to go with the colour and sparkle. 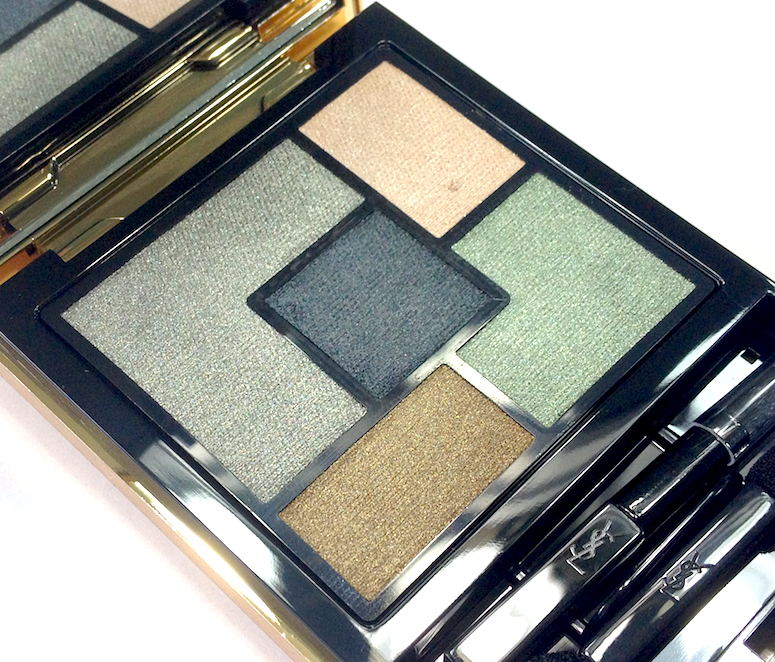 If you're in the latter camp, and have since written off the YSL eyeshadow offerings, I would urge you to take a look at their new Couture Palettes. They are really something else. The packaging and style here is classic YSL - gold metallic casing, simple, elegant, graphic layout. Most of the palettes have a monochromatic theme, though a couple feature more vivid combinations. 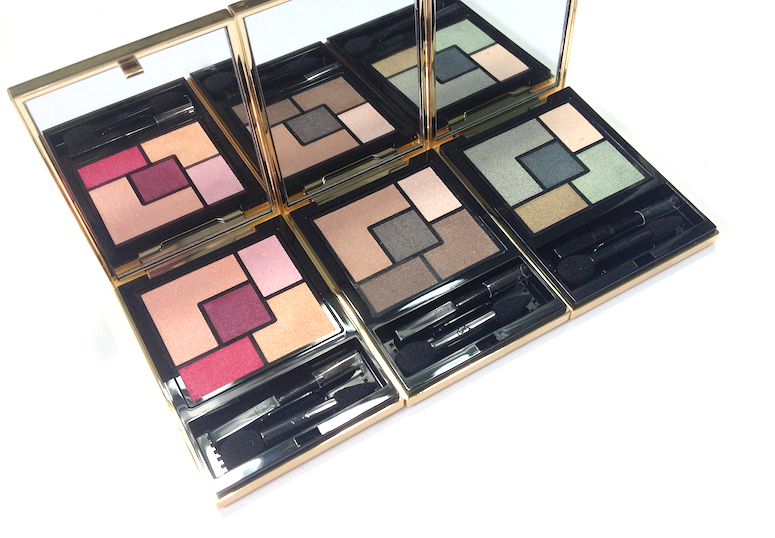 The actual formulation of the eyeshadows is where YSL has proven itself to be truly innovative. When I first touched these eyeshadows, they felt a little dry, and I was concerned. Upon swatching them, I was much relieved - they had some serious payoff. Swatches are one thing, however, and how a product applies to an actual human eyelid is another. They looked on the eyelid exactly how they looked in the swatch. Not only that, they actually looked like do in the pan. They have some of the truest colour transfer I've ever seen. 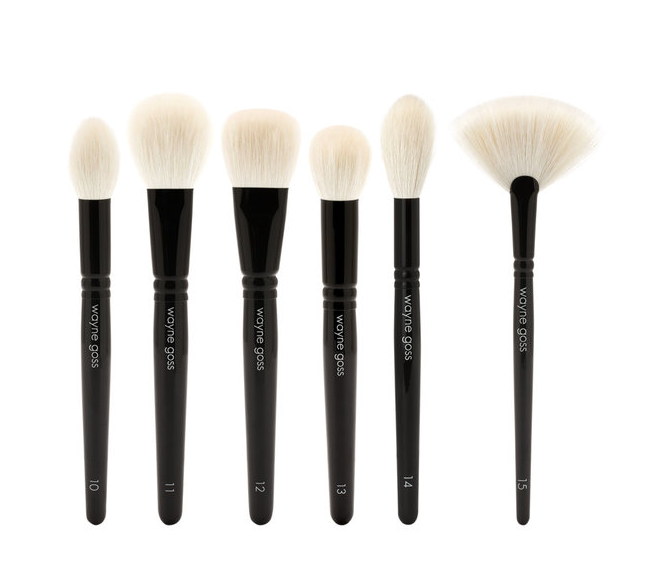 I applied these with my usual MAC paddle brush, and with just a tap into the pan I had a ton of product clinging to the brush hairs. There was a fair bit off powder kick back when I did so, but as long as I tapped my brush off, I had no fallout when I applied it. All the shades went on true and vibrant, and blended out well, without sheering out too quickly. What seemed a little dry in the pan actually felt smooth and silky when used. Each palette has a mix of satin and shimmer/microsparkle shades - the finishes vary subtly from shade to shade, with the darker eyeshadows in #02 Fauves having the most matte-leaning finish out of the the ones I've tried. The satin shades all have strongest pigmentation levels, while the shimmer/microsparkle shades are initially a little sheerer, though buildable. The sparkle is extremely refined, lending a beautiful, sunlight-on-water type of liquid shimmer to the eye. They can be applied all over the eyelid, overtop another shade for greater dimension, or just in the inner corner for an amazing highlight. The wear time on these is very good, with no sign of fading or creasing after 8-10 hours over my usual primer. As far as downsides, other than that bit of powder kick-back to watch out for, I can only think of the value ratio, as they are quite spend for the amount of product you're getting. That said, I think the texture is unique enough, and I don't see any immediate dupes. The #02 Fauves is fantastic, especially for those looking for a workday staple. It's spot-on neutral, leaning neither warm or cool. The dusty camel shade at the top left works perfectly all over the lid, or as a blending/transition colour, depending on your skin tone. 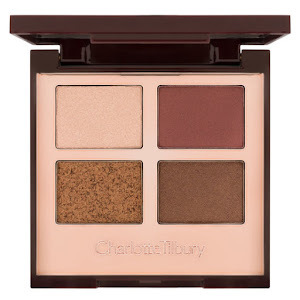 The three brown shades provided varying levels of intensity of creating a defined crease, lash line or soft smoky effect. I do wish there was a bit more variation between the middle two browns, but other than that, I really can't complain. This has become my default everyday palette. 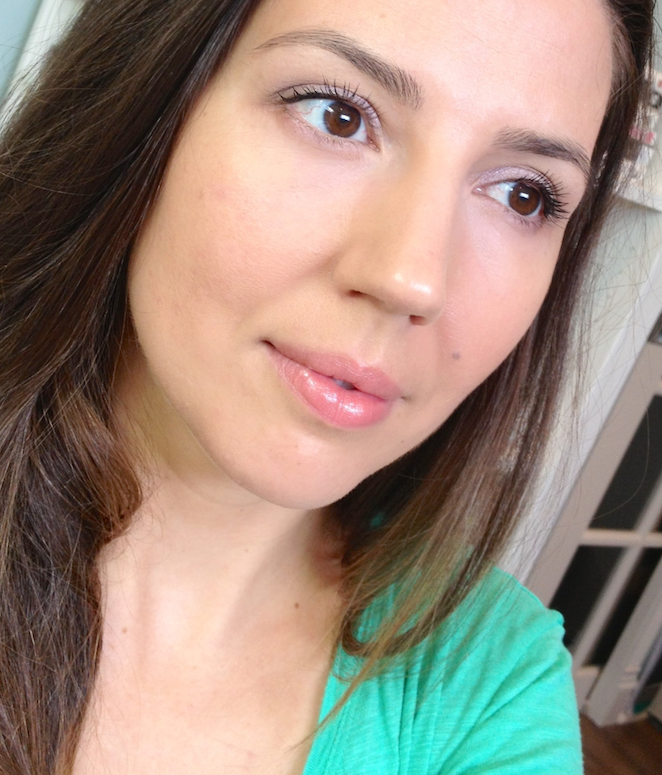 I loooooove green (makes the chestnut in my brown eyes more apparent), and the #08 Avant Garde does not disappoint. I was a little perplexed by the olive green in the bottom left, as it seems so incongruous with the other, cooler leaning tones, but when used together, the look is dimensional, not discordant. 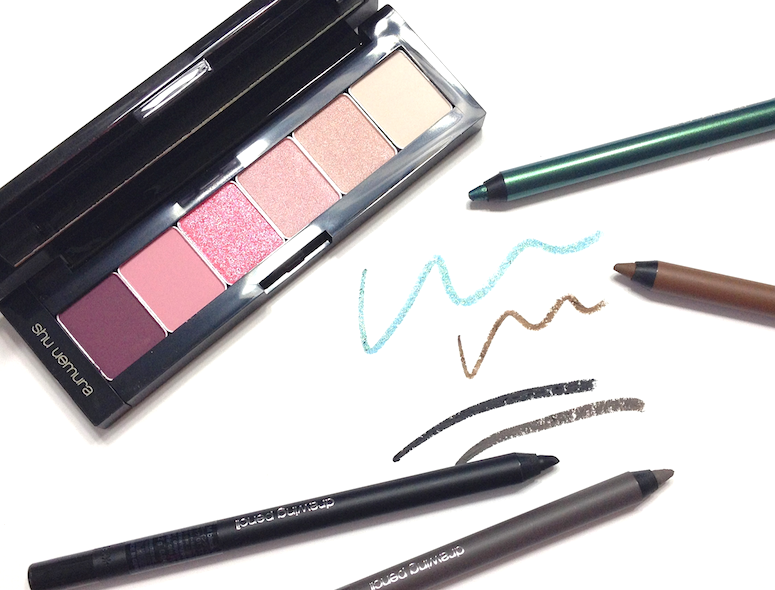 That blackened green in the middle is also an awesome eyeliner. The only downside to this palette is that it doesn't appear to be available in-store at Sephora, though it is orderable. The #09 Rose Baby Doll was a whimsical purchase. I don't what it is about hot pink that draws me in so much, but usually I limit it to lip shades. Somehow I got sucker punched by this one. I....am still figuring it out. That hot pink is just SO VIBRANT. 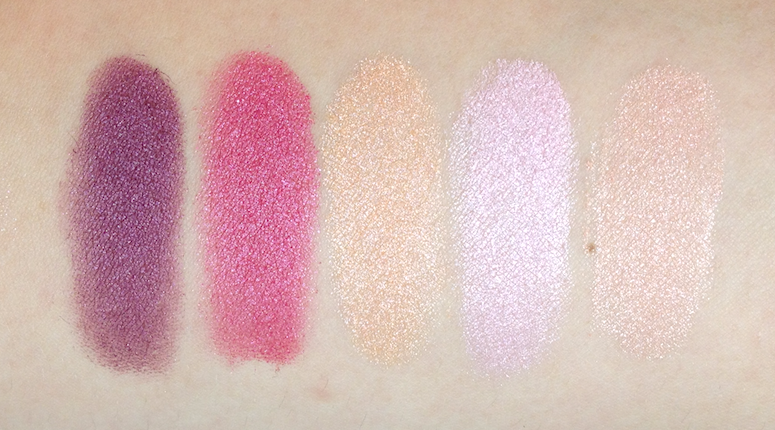 I do kind of wish there was another mid-tone shade in there instead of one of the peach or pink shimmer shades, since they're quite similar. Then again, they're also both so pretty, it's hard for me to complain. Availability: At Sephora stores and www.sephora.com, as well as counters at Holt Renfrew and Hudson's Bay, and www.thebay.com. If you're stateside, they can also be ordered on www.yslbeautyus.com. Price is 60$ USD and 64$ CAD. 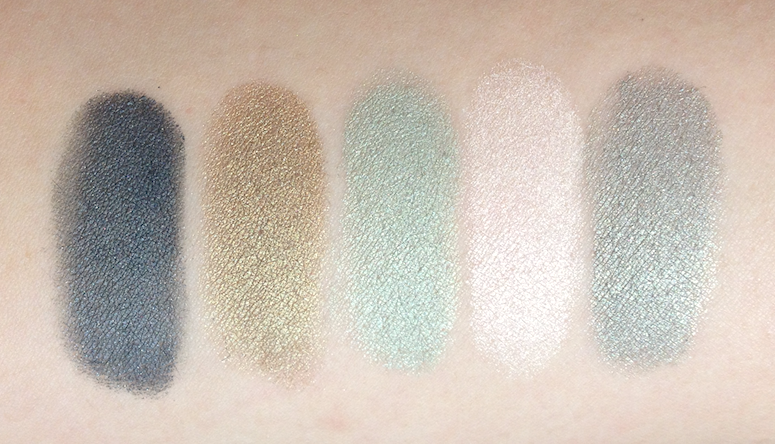 I'm quite impressed by the Couture Palettes, and I know I'll be adding more to my collection soon. How do you guys feel about them?